MEGA64 PODCAST 418 IS READY TO CYBER ALL NIGHT LONG!! In this episode: We travel into the CYBER realm on this very special Cybercast. Have you ever wondered what it would be like to live inside a computer and talk about Marcus' Corner, video games and WestWorld? Watch this podcast to find out that and learn so much more about life. Audio version is here. Our Black Friday sales have come to an end, but it isn't all despair- some items are still available! And more are coming soon. 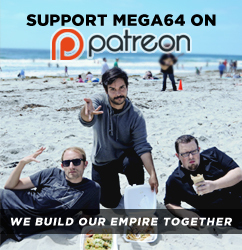 Check 'em out and as always thanks for supporting us here at Mega64!